We ask our horses to do this on an almost daily basis. Please put your head down, open your mouth, and politely put this piece of metal in your mouth. Just think about it, the closest we come to that experience is when we wear braces and, for some, the dreaded headgear. Now think about how much thought you put into the current bit you are using? No really, how much? Was it the cheapest? 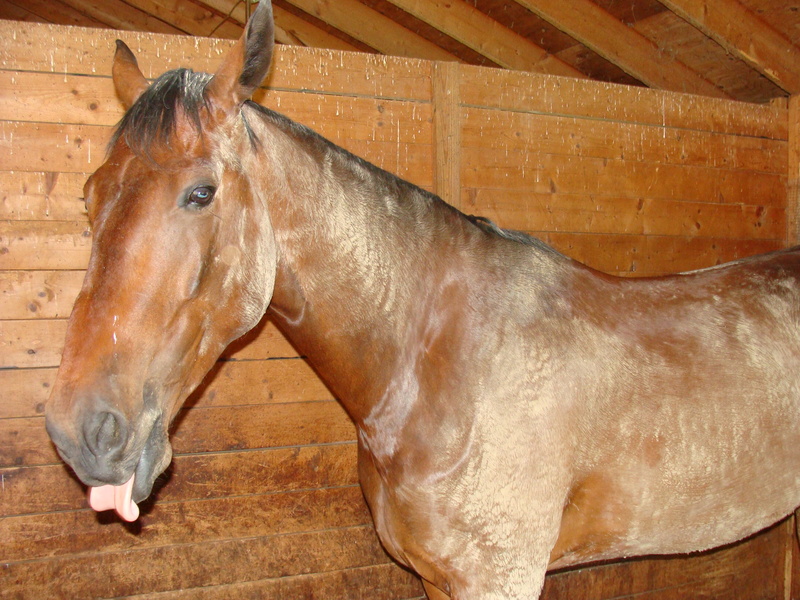 Was it used by the former owner who claimed it was the only bit that the horse would accept? Did you find it on eBay? Did you close your eyes and order the bit that your finger selected? I don’t think any of us would trust ourselves to put on our own braces, but unfortunately there doesn’t seem to be an easier answer for bit selection. Selecting the correct/best bit for your horse can feel like heading out on a quest for the Holy Grail. Checkout any website that sells tack and you will see page upon page of bits. So many shapes and sizes. Lots of different alloys and types of metals and polymers used in the mouth pieces. Which mouthpiece size, thickness, or cheek piece is best??!! Oh yeah, then check out the rulebook for your chosen sport to make sure the bit you have selected is legal for competition. Calgon, take me away! If you have followed Ike’s adventures, you know my struggles with giving Ike a correct half halt and Ike’s difficulty responding to my efforts. He has had a tendency to hang on the bit and run through my aids to the point that it physically hurt to finish my ride. 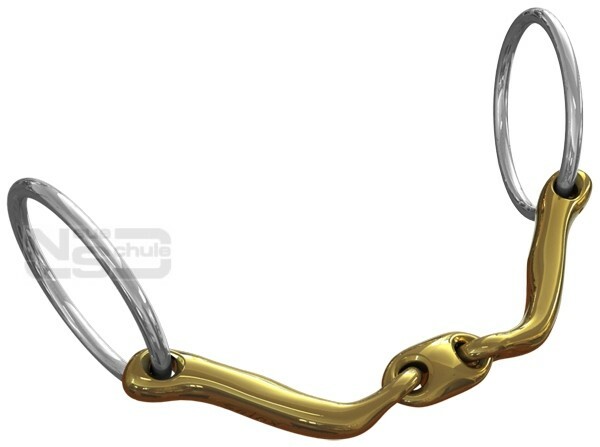 We started with a JP Korstel loose-ring with a French link that quickly transitioned to a basic loose-ring snaffle with a medium thickness for the mouthpiece. It seemed to work for a while, but the stronger Ike has become (read: bigger muscles and more stamina), the less effective the bit and I became at giving clear aids. Where to go next? Enter a Level 1 Myler bit with a loose ring cheek piece. Now we were getting somewhere. Ike was much more responsive and apparently can carry himself. What a shocker. Why didn’t I know about this sooner? We still struggle to get the correct flexion and struggle even more at getting Ike’s body in correct alignment, but those are young horse issues, not a bit problem. And then I was offered an amazing opportunity to try a European brand of bits that are just entering the US market – thank you to the Florida reps for the Neue Schule Company [German for New School and pronounced “Noya Shoola”] for allowing Ike and I to be American guinea pigs for your products. I shared details of our adventures with the representatives – Ike’s age and training, what bits we have tried before, and how he feels while I ride. Yes, I even told them that I feel like I have to carry him around the arena. Based on the information I provided, they sent us their Verbindend bit to try: http://nsbits.com/global/index.php/dressage-legal/verbindend.html. The mouthpieces of their bits are made from an alloy called Salox® Gold. For you science geeks out there (don’t take offense, I am one too), there is a great explanation of the science that went into the engineering the alloy used on their website: http://nsbits.com/global/index.php/technology/the-science.html. Who knew you could combine your love of science with your love of horses? Awesome. What I have found thus far is that Ike salivates A LOT with this bit. 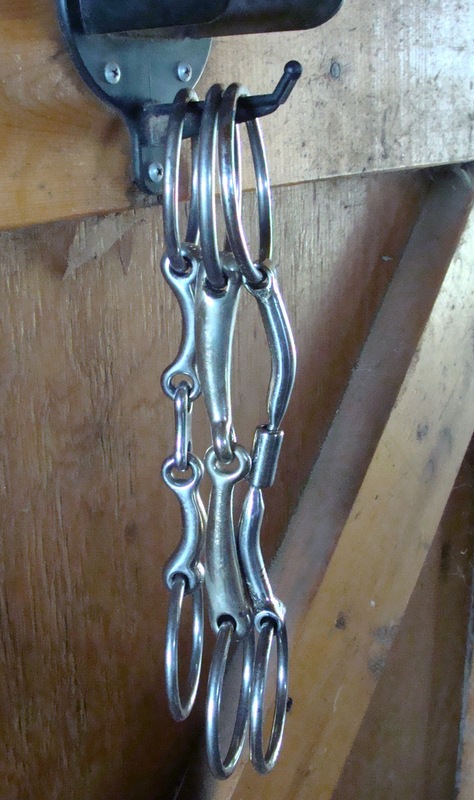 The Verbindend bit is designed to help those who have horses that tend to be heavy on the forehand. I’d say Ike falls into that category when he allows me to carry him…not exactly the feel we are going for in dressage. This bit is designed to “greatly emphasis the signals through the reins.” The Verbindend bit definitely has helped me better execute a half halt and since using it, I’ve not had stabbing pain in my arms and shoulders during my rides. Ike carries himself and I’m able to execute a range of half halts from two fingers to a full squeeze and feel Ike give a response to the aid. Oh, so that is what an effective half halt feels like. Ms. C even had us playing with working trot to trot lengthening and back to working trot and showing clear changes. It is a new concept to Ike, but one that was made relatively easy since he was clearly hearing my aids. We even toyed with walk-canter transitions with some success. This guinea pig is a big fan of the Neue Schule Verbindend bit. Can I say that it is the be-all-end-all for every horse and rider out there? Probably not. There are honestly too many variables in equine conformation, equine age, equine training level, rider skill level, and riding disciplines to say that there is one bit that is always going to work on every horse. But I will say that you should consider this brand of bit if you are in the market for a new bit. My best advice is to contact the company representatives for any brand you are considering. They are very knowledgeable about their product lines and want you to be pleased with your purchase. 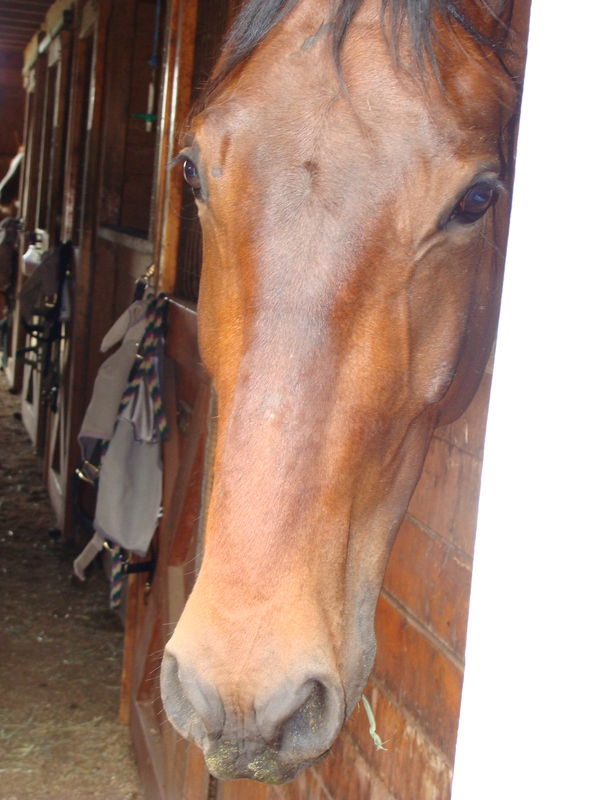 Be honest with what you tell them and you will find that there just might be that perfect bit for you and your horse. Yes, we did make it to our show this weekend after one emergency vet visit, multiple test rides under Ms. C’s watchful eye, and a last-minute, Saturday morning visit by our farrier to put Equi-Pak on Ike’s front hooves. Sheer luck, divine intervention or a miracle? Who knows for sure, but what I do know is that there are many take away lessons from this experience that have nothing to do with the color of the ribbon or the number on the scoresheet…although I will admit that I jumped up and down in the aisle of the barn after earning our first qualifying score for the regional finals. But let’s get back to the big picture stuff. Unless you are a superhuman, you cannot succeed in this sport alone. You need a tremendous support team to make your goals come to fruition. You need to be a reliable client for your veterinarian, trainer, and farrier if you need to call in any favors. Be willing to reschedule your appointments on occasion when they need to take care of someone else’s emergency – one day you will be that emergency call. Pay your bills on time. Show up on time to all appointments. Show your appreciation and most definitely, say thank you. Be kind to your pet sitter so that they will be willing to come let the dogs out and feed them while you are at your weekend show. The kindness is especially important when you have to tell them that you may or may not need them, but can they still keep their calendar open just in case. Be willing to be the supportive “ear” for your friends so that when the tables are turned, they will be there as you vent your latest horse woes. Saying thank you to them is also not optional. Express your gratitude over and over again. And lastly, kiss and hug your mate when the rollercoaster ride is over. They might not always understand your crazy obsession with your horse, but they hop on the coaster next to you to wipe your boots, drive the truck, scoop horse poop, and retrieve your tests and ribbons. If that isn’t love, I don’t know what is. You are not your score or the ribbon color. Who among us doesn’t fret about the score we see on the front of the test? Especially when you know that 55% is going to get posted at the show and online for the world to see. Will they think I’m an idiot who cannot ride? Will they secretly smirk and take joy in my bad luck? Before you sell the trailer, turn the horse out to pasture and throw away those sweaty riding clothes, take that test home and read the individual scores used to calculate that final average. Yes, all the scores. Yes, all the comments, even the bad ones. 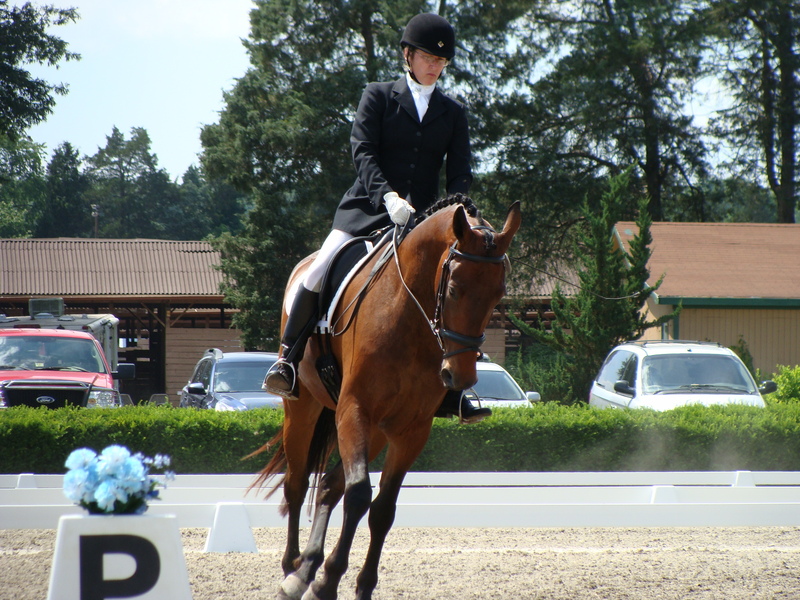 Once you read the individual scores and comments, you realize that up until your horse decided to spook in the corner when it came time for the canter transitions, you were scoring 6.5s and 7s. You know that those 4.5 marks with “horse looks tense” and “explosive transition” comments are due to the horse getting scared by the judge’s booth (there is video as proof). Yes, you have to take your hits for those moments, but you rode through them and stayed on the horse and in the ring. The judge can only comment on that 7 minute ride they see that day. Come back another day and try again….and get a 69.4% on Training Level Test 3 that wins you the class riding in front of the same judge. This is a tough sport. In order to succeed, you will most likely fail once or twice or more times than you wish to remember. It will teach you patience and perseverance if you stick with it. You will be a better person for living through the hard times. It makes the good moments that much more special. At the end of the day, hug your horse. I think we sometimes forget that our horses are not machines. They are living, breathing creatures with minds of their own. If only we could really peer inside those brains to know what was they are really thinking. Wouldn’t it be wonderful if they could tell you exactly where they hurt and how bad the pain was? Unfortunately we cannot read their thoughts, so we are left to interpret the symptoms before us as best we can. We must be the best advocates for our horses and make the best decisions for their health and well being, even if it is not always best for our checkbook or our egos. Had Ike still been off after the Saturday morning farrier visit, I would have scratched my rides. Yes, it would have been disappointing, but it would have been the right thing to do. I got lucky this time. Big Man came back strong and showed everyone just what strong character he possesses. Our horses give us their all, the least we can do is give them a hug. Sigh, where do I start? Life has delivered a load of lemons. I guess I’m supposed to make lemonade, but life forgot to deliver the sugar. I’m hoping instead that someone will get a delivery of tequila or vodka and we can share the goods. My elation from my short ride on Tuesday turned to despair on Thursday. I knew after two or three strides of the walk that something wasn’t quite right. Huh? How can this be? Not now! We have a two-day licensed show this weekend and there are no refunds!!! Ms. C was with us since we were going to do our lesson. I knew from the look on her face that she could see something was wrong as well. We attempted some trot in both directions and the issue became more apparent. Ike was short striding and moving very uncomfortably. I dismounted and we poked, prodded, and felt every joint, leg and hoof. Nothing screamed, “here is where the problem is.” Ms. C hooked Ike to a lunge line and put him on a small circle. Ah, the right front shoulder and leg started looking stiff. 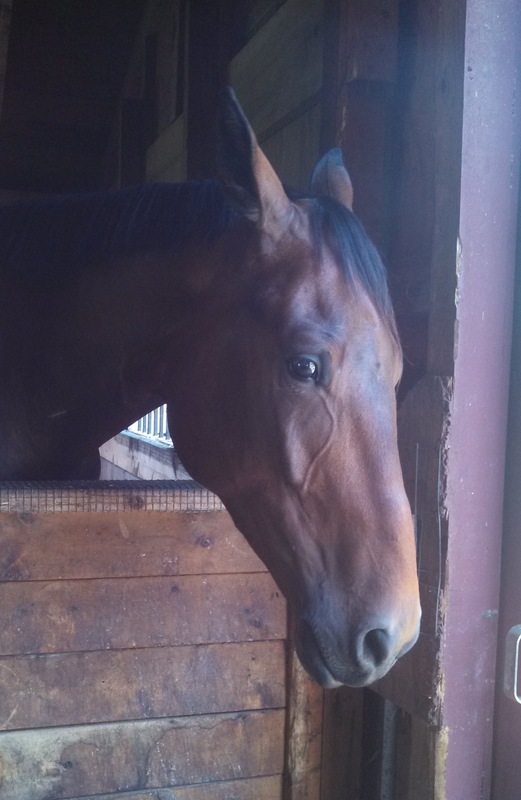 I took Ike back to the barn and debated what to do. To be safe, we cold wrapped the leg and soaked the right hoof in a Epsom salt bath. Now what?! Off to the car to grab the cell phone….and placed a call to the vet. As luck would have it, she was close by and made it within an hour. Her exam found some sore muscles in the left hip and right shoulder, a reactive nail in the left front, and a sore sole for the right front hoof. Sheesh! Three of Ike’s four legs. That isn’t boding well for the weekend. The vet recommended pulling the nail, soaking the hooves, and giving Ike some bute. [note to self – time to refresh my knowledge of the USEF drug rules and guidelines.] Ms. C’s husband is a farrier and he was kind enough to pull the offending nail. All we could do was wait for Friday to come. Today dawned a beautiful day – the sun was out and the humidity was low…a perfect day to ride….or so I hoped. Ike’s demeanor was much more perky today which was a positive sign. But how would he go under saddle? I quickly tacked and headed to the ring. I am happy to report that the walk was normal. I am unhappy to report that while the trot was greatly improved, it wasn’t show worthy. Big sigh. I am pleased with the progress so far, but if things aren’t drastically better in the morning, Ike will be staying home tomorrow for more rest. Here is the game plan: Our farrier is coming early tomorrow to put some Equi-pak (http://www.cottamhorseshoes.com/equithane.htm ) on Ike to help the soreness in Ike’s front hooves. I will then briefly ride Ike to see how he is moving. The decision will then be made to either scratch Saturday’s rides or load the trailer. If we scratch Saturday, we will pray that another day of rest will get us down centerline on Sunday. This is not how I envisioned this weekend, but big man’s health and well-being come first. Now where is that vodka? We are in the midst of a cicada invasion of the 17 year variety. If I looked like these creepy creatures with big red eyes and orange wings, I’d hide under ground for 17 years too. There are so many in the woods out near the farm that I feel like I’m on a distant planet in an old Star Trek episode as they buzz away. They normally don’t bother me as long as they keep their distance. Over the past few days though, we have had a few close calls. At least 6 cicadas dive bomb my windshield with every trip to the barn. I’m starting to question their maneuverability. I’m also weary of scraping the residue off the glass. On another day, poor Ike kept looking at one of the empty buckets in his stall and then looking at me. I finally caught a clue and peeked in the bucket and found a cicada buzzing about apparently unable to find its way out. I assisted its departure and Ike was much relieved. The worst run in came yesterday at the end of my lesson. I’m just glad that there were no cameras around or I’d be a star on YouTube by now. I was still mounted and walking Ike to the gate when I heard a buzzing sound behind me. Next thing I know, a “friendly” cicada decided to land on my shirt collar and THEN start to take a stroll up the nape of my neck and then down my shirt. EEK! UGH! I start squirming and screeching while trying to hold onto the reins and swatting away the offending creature. This causes Ike to jig and become a bit worried. I’m undeterred since there is no way I’m going to let the offending creature hide in my clothing. Although it felt like forever, the struggle was over after about 15 seconds. My new-found friend and I parted ways. No offense, but I don’t think we will be hanging out in the future. Riding this week was challenging as well. Work, a trip out-of-town, and the weather all kept me out of the saddle more than I liked. Ms. C did ride Ike for me one day and had positive things to say about our progress and the Myler bit. She put Ike through the paces to gauge our recent progress. She stressed that he is at the point in his training that we need to be black and white in what we want from him. My sloppy habits aren’t going to help our progress. If we don’t train for excellence, then it cannot be expected on centerline at a show. It won’t be fixed in the next week, but I am going to try my best to think about what I am doing as we work rather than putting on the cruise control as I’m prone to do. I’m still loving the new bit as are my arms and shoulders. It is a great feeling to actually be able to give a correct half halt in the canter and have Ike respond appropriately. With my other loose-ring snaffle, Ike would just lean on the bit. I was just not strong enough to speak effectively. Say what you like, but it is what it is. If all I can do is whisper, but Ike needs me to yell, then we aren’t going to progress until we learn to communicate well. The true test comes this coming weekend when we hit centerline. Will the judge’s see what I am feeling or will they just see the flailing cicada-wearing rider? Find out in six days! It has been 30 years since my last confession and six days since my last blog post, but hey, who’s counting? Please forgive the lack of updates on our progress and goings on around the barn. I have just finished a rather sloth-like week. My only explanation is the July like weather that decided to park itself over the mid-Atlantic region. All I have wanted to do was hide indoors and do a lot of nothing. This weather has not inspired me to walk the dogs, or work in my flowerbeds, or ride my horse. I did ride three times with two of those rides being lessons with Ms. C, but it would have been nice to have a gradual warm up rather than immediate searing heat. By scheduling lessons, it forced me to commit to some serious riding. We now have just two weeks before our first two-day dressage show. I have been struggling lately to get an effective half halt in the canter. Heck, some days the trot is a challenge as well. Ike, as you know, is a big boy and there is a serious amount of strength in those long limbs and giraffe neck. When you add the power of the canter to that strength, Ike can take advantage of my lack of strength and blow through any attempt of a half halt. There are days that my arms burn and ache from the exertion; I feel cramps in my fingers and pain in my elbows and shoulders. Ugh. It is so very frustrating since our progress is stunted by these issues. I was at a loss on what to do other than use large doses of ibuprofen to mask my pain. I was intrigued by the difference with the Myler bit, so I did some research while hiding from the heat. 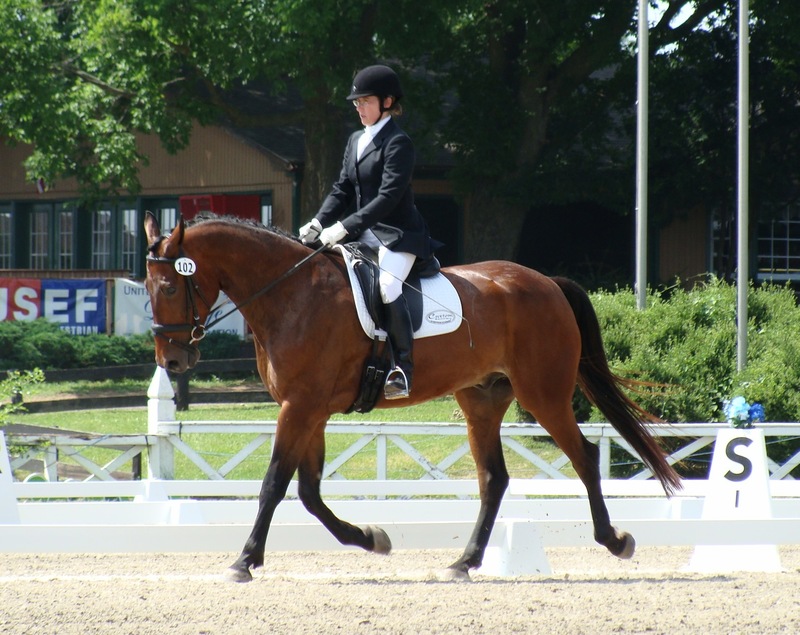 Level 1 and Level 2 Myler bits are approved by the USEF for dressage competition (DR121.16.A). The Level 1 bits apply evenly distributed pressure over the tongue with very little bar or lip pressure. They are recommended for horses just starting with their training. 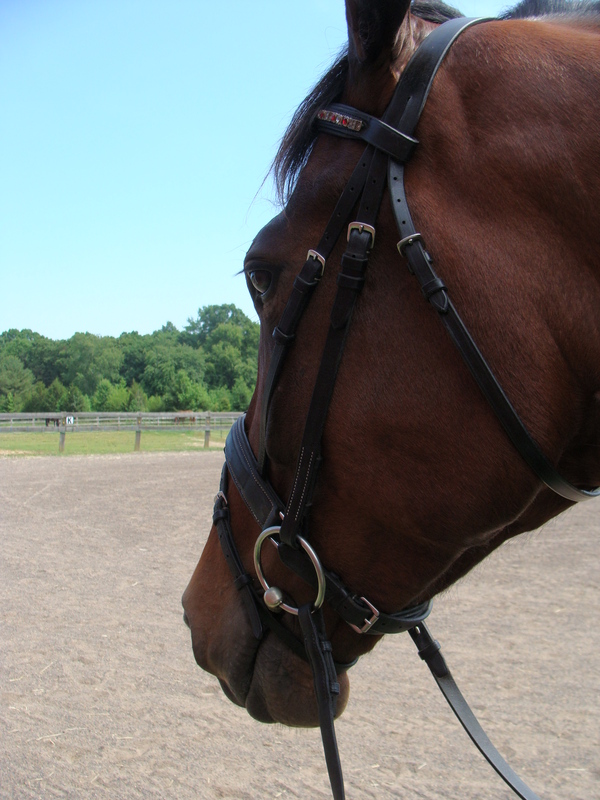 The bars of the bit are curved (known as a “comfort snaffle”) to allow for more space for the tongue under the bit. My research didn’t show any negatives, but before committing to the purchase, I set up a second lesson with Ms. C to try the Myler bit one more time.